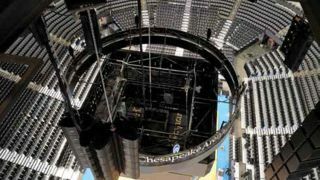 An Eastern Acoustic Works (EAW) Adaptive sound reinforcement system was recently installed at Oklahoma City’s Chesapeake Energy Arena, home of the NBA Thunder basketball team. This is the first Anya system to find a permanent address with an NBA/multipurpose arena. Not only does the new Anya system provide the sound clarity and coverage that the Chesapeake Energy Arena required, but it also offers great system flexibility via EAW’s Resolution software. Richardson, TX-based Marsh/PMK International designed the new system while Oklahoma City-based Ford AV provided system integration and installation. After much deliberation—which included demonstrations of several other EAW loudspeakers—Jerrold Stevens, associate principal/director, AV systems at Marsh/PMK, specified the Anya PA. Not only does the new system provide the sound clarity and coverage that the arena required, but it also offers great system flexibility via EAW’s Resolution software. Stevens specified four straight-hanging Anya arrays, which were hung above the scoreboard. The far ends (north and south) of the arena are covered by arrays made up of two columns of six-high Anya modules. A pair of four-high, two-wide column arrays covers the close-in (east and west) sections of the arena, providing 360 degrees of horizontal coverage. EAW’s Resolution 2 software lies at the heart of control and system flexibility—another requirement by arena management. Because the arrays are configured digitally via Resolution, the coverage pattern in the multipurpose venue can be changed at the push of a button, adding increased flexibility. Five presets are loaded on the system, providing the ability to switch between full room, just lower bowl, lower bowl without retractable seating, upper and lower bowl without retractable seating, and upper bowl only (to serve as delays for touring systems). The change between presets takes about 2-3 seconds, and the acoustic effect is impressive, Stevens said. The new Anya system isn’t the only audio component that contributes to system flexibility. Stevens specified a Yamaha CL3 console in a road case that can be easily placed on the arena floor when an event warrants it. Typically, the console is located in the new mix position located on the upper level in front of the seating area. Dante connectivity, as well as access to the secondary and house network, is available at FOH, on the arena floor, and via additional Ethernet connections located throughout the venue. A Yamaha Rio 3224-D Dante I/O box aids in transport to and from the new mixing console via Dante. Two additional Yamaha Rio 1608-D boxes in portable road cases provide inputs and outputs at any location with access to the Dante network. The entire system runs on the Dante platform, providing control and signal routing between the new mixing system, existing DSP, and the Anya loudspeaker arrays via standard Ethernet. Now almost halfway through the basketball season, the Thunder—currently ranked sixth in the Western Conference—are keeping their fans on their feet with the excitement generated by the new Anya sound reinforcement system.